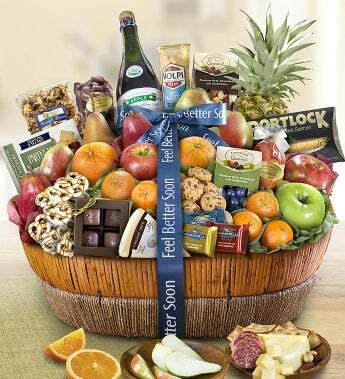 Send warm greetings with this deluxe basket filled with premium quality gourmet foods, fruits, and sweets. This handsome basket is tied with a Feel Better satin ribbon and is filled with six types of fresh fruit, nuts, snacks, chocolate and much more. This gift really shows how much you care!! Send warm greetings with this deluxe basket filled with premium quality gourmet foods, fruits, and sweets. This handsome basket is tied with a Feel Better satin ribbon and is filled with six types of fresh fruit, nuts, snacks, chocolate and much more. This gift really shows how much you care!